The family company Malmar was established in 1947. From the start we focused on metal processing. Thanks to its many years’ experience Malmar is strongly specialised in the production of (semi )finished metal components and products. For about two years now, Malmar is part of the dynamic De Pecker Holding. Apart from Malmar, De Pecker Gent NV is also integrated in this group. They are specialised in maintenance and repair of machines and production lines. Malmar is located in the Ghent canal area, which offers the advantage of a favourable central situation at a junction of main roads. Due to the lack of production capacity and the need to be more present on the growth markets, we recently founded the sister company “Malmar Latvia”. This start up has undoubtedly marked a new era of further internal and external increase. Malmars’ power is based on very strong values, which are respected on a daily basis. Central focus is on the customer. Flexibility, honesty, openness and care for the environment are also important issues in the Malmar policy. 1. Excellence in quality: Certified ISO 9001:2000, and by December 2007 also certified ISO TS 16949 2. Some top references among our customers 3. Central location and easy to access 4. Environmentally safe production 5. Flexibility in production thanks to our short set-up times 6. Integrated production facilities: in-house paint shop (zinc phosphate, wet paint, primer and powder paints). The surface treatment has been approved as a process by Volvo AB , Daikin and CNH. 7. Dynamic management with vision on the future so the right investment decisions are taken 8. "Company engagement" of Malmar towards its customers with accurate follow up of projects and customer reporting 9. Team-spirit, both internal and external towards the customer 10. Continuous investment in “state-of-the-art” production machines. Experience and references make Malmar proud to be a FULL PARTNER FOR THE REALISATION OF YOUR NEEDS AS A CUSTOMER! Malmar disposes of a Trumpf Trumatic L3030. This laser cutting machine has a capacity of 3kW. It is provided with a cutting table of 3000 x 1500mm and can handle plates up to 20mm thick. Apart from steal (up to 20mm), aluminium (up to 8mm) and stainless steal (up to 10mm) can also be cut at the right lengths. On simple request and at competitive prices, Malmar can help you out with laser cut material! In order to make optimal use of the production capacity, the laser cutting machine has been equipped with a Liftmaster that automatically positions the plates on the cutting table and disposes of the cut material. Speed and efficiency are continually aimed for at Malmars’. Trumpf punching/laser cutting machine TC 6000L, 3.2kW including sheet master: automatic feeding of plates to the workstation and automatic removal and sorting of the finished parts. Maximum dimensions 4.000 x 1.500mm Maximum thickness for punching: 8mm Other possible treatments * Cutting of folded material * Marking * Tapping of screw thread and making of bends And all of this performed by the same machine! Also called cold pressing. A rivet is cylindrical and generally has a rounded head on one side. On the clinch-nails or rivets an extra “head” is fitted by means of a riveting unit to connect both parts firmly. 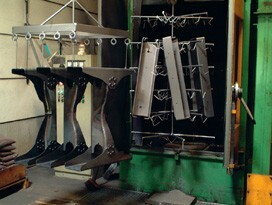 Malmar disposes of 2 riveting units and applies this technique at request of the automotive industry. An example are the cross members (crossbeams) in the chassis of a truck or a bus. This department at Malmar has several semi automatic welding machines. Malmar can weld steal, aluminium and stainless steal. For this purpose Malmar has at its disposal 5 semi automates, for example the Fronius Magic Wave 2200 that can weld both MIG and TIG. When larger series are requested by the customer, we try to weld these products as much as possible with the ABB welding robot. 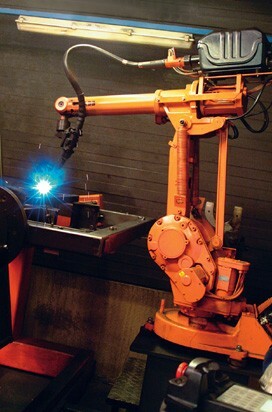 Finally we can also offer you spot welding. This technique makes it possible to mechanically clean the products. By means of a turbine a whirlwind of fine steal grains is created. These are projected against the product parts that are suspended at a blasting beam in the machine. The impact of these steal grains cleans the parts from grease, surface rust or other impurities. A visual control is carried out on each piece. This phase in the treatment is essential in preparation of the powder coating of the pieces and is proven to be more efficient than for example sandblasting. 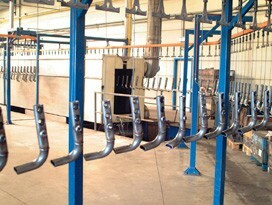 This department contains one of the most modern powder coating lines of its kind. Pre-processing: The pre-processing exists of a Trication system. This means that the modified low zinc system uses apart from Zinc (Zn), also Nickel (Ni) and Manganese (Mn). The process technology used here, is one of the best of its kind. We distinguish 8 different steps: * Degreasing * Cascade rinsing * Activation * Zinc phosphating * Rinsing * Rinsing * Passivation * Demineralised rinsing Application of primer: After the pre-processing, robots apply wet primer. The type of primer is an air drying water-based primer. Powder coating: Finally the product gets a powder coat layer (final layer). Malmar guarantees to create a perfect adhesion! It is important to know that during and after the process, the pieces are thoroughly checked. Process control is a part of our daily policy, in order to deliver you a high standard quality final product. At the pre-processing for instance, we use the SPC method. You don’t dispose of the necessary capacity to make an entirely finished product, or to package it,... Here we make an analysis at your request, to see if Malmar can satisfy your needs. 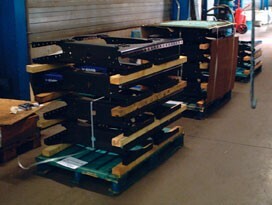 If so, we assemble the different parts to a semi finished or final product. This can go from simple riveting to assembling ready made parts. Finally the products are labelled, packed and prepared for our expedition department, ready for shipment.